Clothing/Jewelry Description A green tank top, denim shorts and no shoes or socks. Distinguishing Characteristics Caucasian male. Sandy blond hair, hazel eyes. Breiton's name is pronounced "Bry-ton." 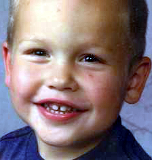 Breiton was last seen near Alton, Iowa on May 22, 2005, while on a fishing trip with his family. There were three adults and four other children present. At the time, they were on a small cement bridge over Willow Creek. Breiton's family lost sight of him for less than a minute between 3:00 and 4:00 p.m. and he disappeared. He is believed to have fallen into the creek and drowned, but an extensive search of the water turned up no sign of him or his remains. His case remains unsolved. Updated 3 times since October 12, 2004. Last updated August 12, 2013; picture added, clothing/jewelry description and details of disappearance updated.